Up/down arrows highlight fields, and left/right arrows apply changes. jip-align (a.k.a. align) is an interactive alignment and display package. The package is designed for registration to some standardized space (rather than alignment between volumes in native space), so that extra-cerebral tissue can be ignored simply by application of a standard brain mask. Mutual information (MI) is the only cost function employed in this tool. 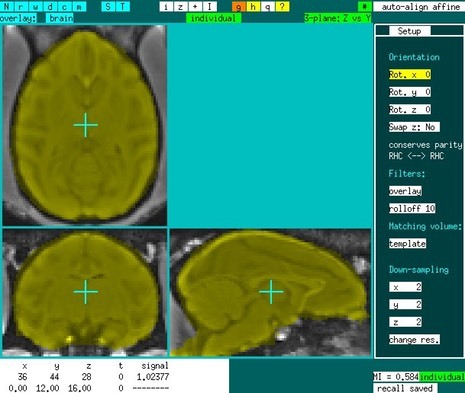 Human analysis tools often enforce an acquisition & analysis scheme that requires a fixed contrast for cross-subject alignment (e.g., high-resolution T1-weighted MRI). MI enables alignment across different types of contrast (e.g., single-shot EPI versus multi-shot T1 or T2), which is particulary useful for preclinical imaging for many reasons. Removal of extracerebral tissue by skull stripping is not necessary for each subject. Rather than use boundar-based registration, this tool uses all voxels that fall within the brain region defined by the template. The template either could be stripped of extracerebral tissue (zeroes outside brain) or defined by an overlay, which is the preferred method. A disadvantage of a method that does not rely upon boundaries is that the "capture range" is somewhat less than for a boundary-based method, so manual adjustments sometimes are needed to bring the subject close to the template. An advantage is that skull-stripping, which has its own problems in the preclinical setting, is avoided altogether. Note that this strategy is most useful when one registers everything to a template. You can use an existing template or create your own, but the point is to define a brain mask in a standard space, and not for each animal individually. Some manual spatial initialization often is required. The first alignment page enables a switch of axes using 90-degree rotations (e.g., coronal to sagital). If one want to switch the coordinate-system handedness, this can be done as well. The affine alignment page can be used for further adjustments. A surface coil leads to rolloff of signal intensity in the ventral direction, whereas volume-coils or phased-array coils may have different intensity variations across the field of view. To reduce these variations, a "rolloff filter" is used. In this method, both volumes (subject & template) are divided by low-pass -filtered versions of themselves. The range of the low-pass filter determines the flatness of images versus the fidelity of fine structure. Good values typically are between 4-10 (=FOV/4 or FOV/10). However, sometimes higher values can be used, as for instance in a filament-model stroke in rodent, where an entire hemisphere has an altered signal intensity. To increase speed, images can be down-sampled so that they contain fewer voxels. An initial down-sampling setting is defined according the dimensions of the template image, but this can be changed by the user. During automated alignment, downsampling is reduced one level (factor of 2) in each dimension two times (e.g., 4->2->1 or 2->1->1). Generally, just modify the down-sampling factor for the "x" direction, and "y" and "z" factors will be adjusted accordingly based upon resolutions. Affine alignment maintains all parallel lines in the original image as parallel lines in the final registered image. This is a generalization of rigid-body alignment that also includes adjusts for size and skews. Affine alignment adjusts 12 parameters: 3 shifts, 3 rotations, 3 inflations, and 3 skew. To exclude a parameter from alignment, highlight the parameter and remove the "x" next to it by using the "x" key. Alternatively, define which of the 12 parameters to use on program entry from the Unix/Linux command line. After affine alignment, tissue can be stretched to better conform to anatomy. A typical application would attempt to reduce image distortions from an EPI functional series by "unwarping" the data using an undistorted template (same subject or group template). Distortion fields are defined by overlapping 3-dimensional basis functions that look like pyramids. Basis functions are defined at several levels of resolution, and all low-resolution basis functions are linear combinations of high-resolution functions so that any distortion field (x,y,z) can be represented consistently at any resolution level. The diffeomorphic (hopefully!) algorithm is regularized by enforcing a smoothness criteria as a penalty term in the cost function. The degree of expansion/compression can be limited by setting a minimum/maximum Jacobian determinant for the local deformation field (Jacobian =2 means stretching is limited within 0.5 to 2 times the undeformed field). jip-align determines affine registration parameters and optionally 3 3-dimensional distortion fields, but it does not modify the subject image data. Rather, it outputs the information into a file ("align.com") when the program exits, and then this file can be used to register one or more time points using the command-oriented program named "jip".